Puerto Rico is la isla de encanto (island of charm). Though a small commonwealth in the Caribbean, it is home to a lot of people and it's own special culture. They are a beautiful people and have a lot of great waves and surfers to ride them. There are currently four different Christian Ministries to surfers in Puerto Rico. One of the guys I've known for a little time now is Yossua Lugo, who leads with his team a ministry called Agua Salá. Earlier this year, We invited Yossua to Christian Surfers' International Conference in Costa Rica. 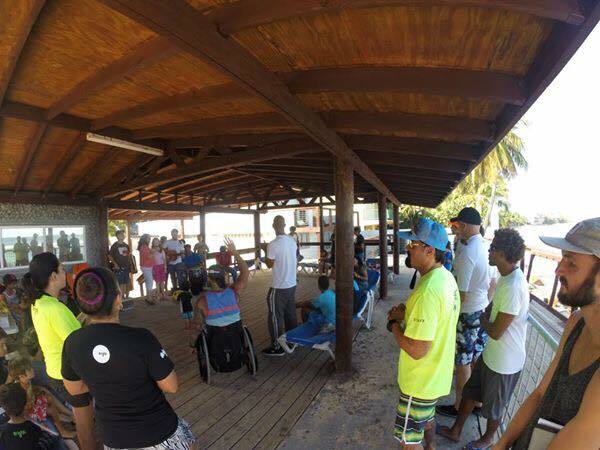 It was Yossua's first involvement in a surf ministry outside of Puerto Rico and he was able to see a whole International body of surfers coming together with the same purpose of seeing other surfers know Jesus Christ. Yossua and I both knew that we needed unity in Puerto Rico among the surf ministries. We knew that if we all represented Christ towards the same community and were in conflict or competing against each other it would do more harm for our testimony than good. Change needed to happen. There has to be a way where we can all work together in a unified manner for the glory of God. After the dates for a surf ministry retreat fell through, Yossua had the idea of doing a breakfast over Thanksgiving weekend and inviting all the ministry leaders on the island. (yes, they celebrate thanksgiving in Puerto Rico!) So when Yossua told me the idea and had confirmation of attendance from most of the ministries, I knew I had to be there in support of it! So I bought a plane ticket and was on my way. The breakfast was full of laughter, worship led by local shaper, Nestor Ramirez from Pelicano Surfboards, and a message on a unity that God calls us to have as Christians. And of course, Breakfast. Anyways, the ambience was so full of love and encouragement that I knew this could only of come from God. I was able to have multiple conversations with the different leaders about being humble and needing to work together. Actually, they were the ones who probably talked about it more than I did! At the end of our time together we were able to pray together and here a couple testimonies of local surfers growing in their relationship with Christ. In my last conversation with Yossua before I left to go home, he excitingly told me how he was going to meet with the other leaders in order to come up with a plan on how they were going to work together in the year 2015. It was an answer to prayer! It was God speaking to individuals in a way that we all knew it had to be from HIM. Please continue praying for the community of surfers in Puerto Rico. That God blesses the ministries as they begin to work more together and grants them peace and grace as they try and reach their fellow surfers for Jesus.